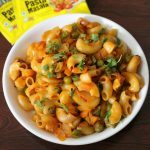 Smith and jones pasta masala recipe is a quick snack recipe made using macaroni pasta in a readily available pasta masala powder. Usually to make macaroni pasta we need to use pasta sauce, veggies and it does take time to make the pasta sauce and then add it to the boiled pasta. Here, in this post I shall be sharing a wonderful trick to make macaroni pasta quick and easily. Today, I will be sharing with my blog readers a wonderful and easy pasta recipe which can be made in a couple of minutes without any special pasta sauce required. The smith and jones pasta masala recipe is a ready made recipe and the whole recipe can be prepared just by using a readily available pasta masala powder and we need to have macaroni pasta readily available. The macaroni that I have used here is ‘elbow macaroni’ which can be easily found in grocery stores in various brands. We can add various other veggies like cauliflower, corn kernels etc… to make it more delicious. 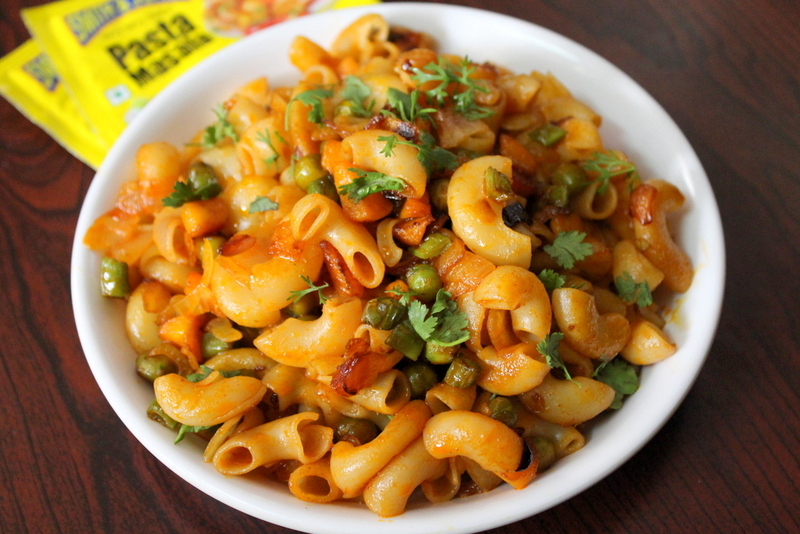 The pasta masala that I have used here is of Smith and Jones and it is very easily available for just Rs 5.. It is a wonderful tiffin box or lunch box recipe for kids and a perfect snack as well. There are many many varieties of pasta recipes that are made and we all love to taste Italian cuisine and pasta is one of the tastiest Italian dishes which we all Indians prefer to prepare in our kitchens. Today, in this post I am sharing one of the simplest form of pasta recipe that can be a quick breakfast recipe when one is in a hurry and do not have time to make time consuming breakfast recipes. If one does not have various veggies, then the dish turns out well with just onions and pasta masala powder. This dish requires only two main ingredients to make it that is smith and jones pasta masala and macaroni pasta to make the dish. To make macaroni, we first need to boil the macaroni for few minutes, strain the pasta and then stir fry the boiled macaroni pasta with pasta masala powder. Below I have shared the recipe with a video procedure as well as in written instructions and hope all my blog readers love my recipes and hope to receive a wonderful feedback from this quick recipe. 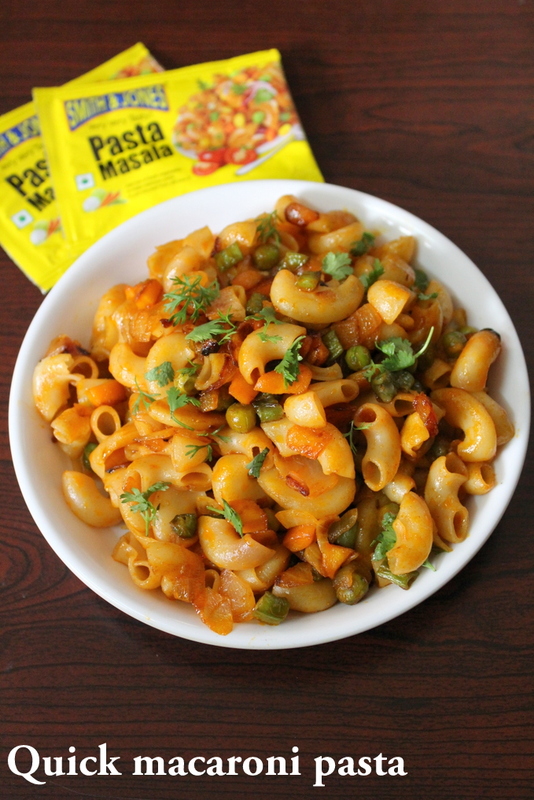 A quick and easy macaroni pasta recipe made using elbow macaroni and ready made pasta masala powder. Firstly, in a pan, add some water and boil it. Add 1/2 tbsp of oil into it. Add 1 cup of elbow macaroni and boil the macaroni for 8-10 minutes. Add cold water all over the boiled pasta and strain the pasta completely. The boiled pasta is ready to be used later in the recipe. In a pan, add oil and heat it. Add the chopped carrots, chopped beans, green peas, finely chopped onions. Stir fry the veggies well for 3-4 minutes on medium flame. Add the boiled macaroni pasta, stir fry the pasta for few minutes. Add 1 full packet of smith and jones pasta masala. Mix or toss the pasta well. Stir fry the macaroni pasta for 2-3 minutes. 1.This macaroni pasta recipe can be served to kids as a quick evening snack or as a quick tiffin box or lunch box recipe.